Sudanese security forces used teargas to break up a crowd of hundreds, mostly young women, demonstrating against the detention of women arrested at previous protests, witnesses said. The protesters chanted: “Long live the struggle of Sudanese women”, and “Down, that’s it”, one of the main slogans calling for the fall of President Omar al-Bashir during protests that have swept Sudan since December 19. Security forces at the protest, in Omdurman, Sudan’s second-largest city, were seen arresting young women and taking them away in at least four pick-up trucks. The protesters were trying to march towards a women’s prison before security forces moved in. 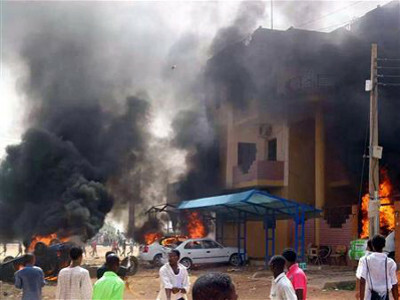 The protests across Sudan were triggered by a worsening economic crisis and built into the most sustained period of unrest since Bashir came to power three decades ago. Bashir and senior officials have adopted more conciliatory language about the demonstrations, including promises to release jailed protesters, but security forces continue to break up rallies and arrest people. In Omdurman’s Wad Nubawi neighbourhood, protesters blocked a road, setting fire to branches and throwing stones before security forces fired teargas to disperse them. Dozens of doctors protested inside the state hospital in El-Obeid, the capital of North Kordofan state, calling for Bashir to step down, witnesses said.